Alan Greenspan, who led the Federal Reserve for 18 years and pushed through the Gramm-Leach-Bliley Act that led to the expansion of banks into the brokerage, insurance, and investment banking businesses. 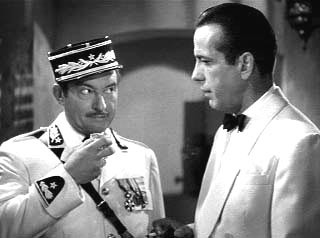 According to his testimony to Congress today, Greenspan was “shocked, shocked” that he was wrong to believe “banks in operating in their self-interest would be sufficient to protect their shareholders and the equity in their institutions.” Suuure, we believe you Greenspan, just as we all believed Captain Renault in the film Casablanca. I’m really disappointed that people think that a law meant to help poor people own their homes is the cause of this systemic financial crisis. I want to lay out why this is not only wrong according to all data out there, but is reprehensible to even bring up. And I know that this is a right wing talking point lately, so it must be addressed. The Community Reinvestment Act (created in 1977 and updated in 1995) is not the problem here. Other than just being racist code for saying blacks can’t pay their bills, its flat out wrong. THE DATA IS VERY CLEAR ON THIS. [Using sub-prime borrowers and minorities] as a wedge issue to make people who pay their mortgages believe that the people who are getting the benefit of the 700 billion dollars, that we’re being asked to pay, are poor, minority people who caused the crisis. default that are being attributed in this discussion. And what this does is to say, this problem is a problem that was caused by black people. And it means that it gives an opportunity to bring up that old wedge. But I think the people in the country are smarter today. I just don’t think it’s going to fly. I think that people understand that the enemy is not a person who got a home loan and was tricked into getting that loan by a fast-talking broker who originated the loan but that the problem was the securitization process, the high leveraging that Wall Street was doing, the lack of regulation. Watch the whole interview here. The discussion on the Community Reinvestment Act starts 8 minutes in. The Gramm-Leach-Bliley Act, passed in 1999, was a huge part of this whole crisis. It is the main reason that banks are failing, because it allowed real banks, subject to regulation, to combine with unregulated investment banks. The problem with that is the investment bank side of the business can become so toxic that it can take down the normal bank part of the conglomerate. The risky, unregulated companies are the ones going down: Lehman, Bear Stearns, Morgan Stanley, etc. The regulated ones that are still mainly just banks: Bank of America, Wells Fargo, Chase, are still standing, for now. The deal, made in the Glass-Steagall Act passed in 1933, was that if you are a bank and want to be FDIC insured, you must follow regulations. One of which is you must maintain a minimum amount of capital in order to be able to pay back your customers. The ratio was 8 to 1, I think. Gramm of Gramm-Leach-Bliley, is the Phil Gramm who was chief economic advisor to McCain until he made his “whiners” and “mental recession” comments. He ran UBS bank which is now going down in flames. He was McCain’s front runner for Sec. of Treasury and may still have been until this whole financial crisis blew up. Obama is second among members of Congress in donations from Fannie Mae and Freddie Mac’s employees and political action committees, even though he’s only been in the Senate since 2005. The former chairman of Fannie Mae originally led Obama’s vice presidential search committee but had to step down in a controversy over favorable loans he received, while at Fannie, from a company doing business with Fannie. Among Obama’s contributors are three directors and one senior vice president of the two companies. Furthermore, Obama’s fellow Democrats in Congress have long been enablers of both corporations. And what about John McCain? His entire campaign team stepped right out of a predator’s ball. His confidante and top adviser lobbied several years for Freddie Mac. His deputy fundraiser lobbied Fannie Mae, and his campaign manager (Rick Davis) lobbied for both of them, leading a coalition of beltway insiders whose goal was to “stave off regulations” that might have short circuited this nightmare. One wealthy member of Freddie Mac’s board has contributed more than $70,000 to McCain and Republican Party members working for McCain’s election. Even the guy who vetted John McCain’s vice presidential options is a former lobbyist for Fannie Mae. Obama also has Robert Rubin and Larry Summers on his team, and they supported Gramm-Leach-Bliley. Clinton signed that terrible bill at their request. Republican Alan Greenspan also pushed hard for that bill. Democrats are not guilt free in this. Dodd was a part of it too, and so is Barney Frank. But I would say 40-50% of Democrats are complicit, while 90% of Republicans are complicit. THE REAL PROBLEM: “A housing bubble, a mortgage bubble, an equity bubble, a bond bubble, a credit bubble, a commodity bubble, a private equity bubble, a hedge funds bubble are all now bursting at once in the biggest real sector and financial sector de-leveraging since the Great Depression” (quote from NYU professor Roubini). In housing, greedy companies gave out all these crappy loans so they could make their $2000 commission (called closing costs). Note that the higher the price of the house, the higher the commission, so high prices were in their favor too. They also didn’t care if the loan was even paid back because Wall Street had created a new thing in the 80’s where home loans could be bought from the primary lenders and sold as securities in bundles. The bundles sounded great because when you pool all these loans together, the risk is spread. So lots of folks bought these things on the promise they were “safe,” such as the School Boards in Kansas and pension funds in Iceland. Wall Street in the meantime made billions on commissions for selling these stupid things, again, whether or not anyone defaulted on their loan. So the problem is a lack of regulation, it is so blatantly clear. Go research the funding of US regulatory bodies, such as the SEC. Their budgets are amazingly small, even after the debacle of Enron and others just 7 years ago. THESE ASSHOLES JUST WANT TO BLAME POOR BLACK PEOPLE. If you want the whole housing thing explained in cartoon form, see this. His thoughts were enormously profitable. And he was rewarded. His work was rewarded. I don’t mean personally greedy. I mean that his work was supported at the university, at think tanks, in the production of a ten-part documentary series called Freedom to Choose, sponsored by FedEx and Pepsi; that the corporate world has been good to Milton Friedman, because his ideas were good for them. …what we are seeing with the crash on Wall Street, I believe, should be for Friedmanism what the fall of the Berlin Wall was for authoritarian communism: an indictment of ideology. Or watch the video here. Her speech starts about 11 minutes into the program. One of my biggest worries about Obama is that his economic policies will be as right wing as Bill Clintons. And the fact that Obama taught at the University of Chicago and has some “chicago boys” on his economic team is scary. But of course Obama is miles ahead of McCain on most issues, even economic ones, so what can we do?